Avanti Mansion is a beautiful wedding venue. Christina and Nick decided to have their ceremony, photos, and reception there. They also got ready there in the bridal suites. The bride and Groom had a candlelight ceremony in the library. The aisle was lined with glass vases of flowers and candles. There were candles along the window sills and fireplace. Then the lights were turned almost completely off. It was very intimate. After ceremony, the room was cleared out. We were finishing up family portraits and Neal asked Avanti if they could keep the candles on the fireplace lit for a few more minutes. We wanted to do some photos with the bride and groom. We had Christina and Nick face each other and get really close. Nick grabbed his lovely wife gently by the face to pull her in. We wanted him to tease her and almost kiss. Since the ceremony was so intimate we wanted to keep the same vibe for this image. We used the candlelight for backlight. It cast a faint glow. Then we used another light to brighten the bride and grooms faces. The color image is gorgeous. But, when Neal decided to edit it black and white, it became amazing! It looks more romantic, but very dramatic at the same time. We kept the intimacy of the ceremony with the candles on the mantle! One part of this image, Neal Urban knew he had to fix was the walls on the sides of the fireplace did not match. When we looked at the image later, he mentioned he wanted the book case to be on both sides and be mirror images. I agreed. That was some of the only post editing that was done. 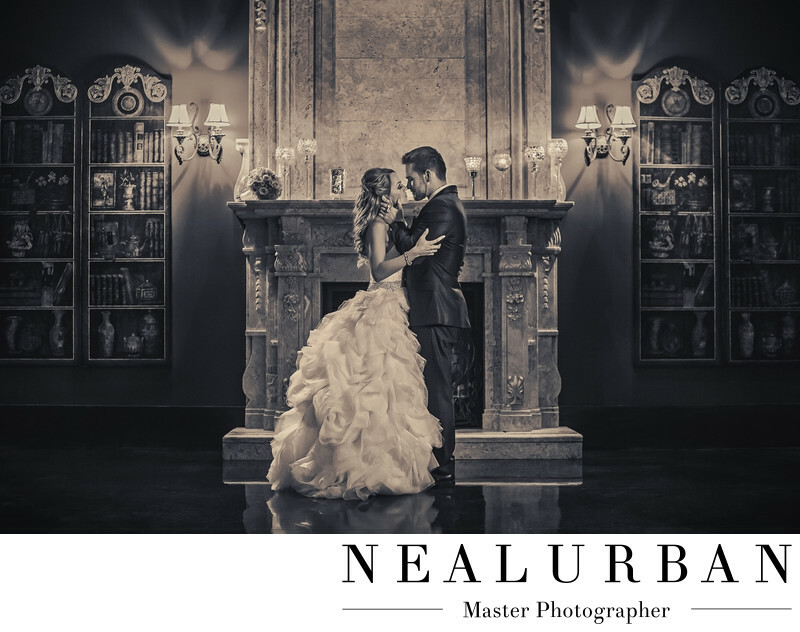 This is one of our favorite images with a bride and groom at the Avanti Mansion. Location: 4409 South Park Ave, Buffalo, NY 14219.